Quality craftsmanship and products for a lifetime of use! When it comes to your home, turn to someone who values quality and takes pride in excellent workmanship. Efficiency Window is a family owned business operating since 1997. Owner Kevin Evulich has 23 years of window installation and window replacement experience and brings that expertise to every in home consultation. Our commitment to professional excellence includes the highest quality service, craftsmanship and products at the most competitive price. We use our knowledge to help our customers achieve the results they are looking for by sharing up to date information on all available options and the latest innovations in replacement window service. We install new window construction, retrofit window installation and have developed innovative hybrid window installation methods designed to provide a highly desirable new window construction appearance without the typical extra costs and time traditionally involved. While retro fit window installations are less costly, they have a (well deserved) bad reputation for poor performance and an unsightly appearance. Using our experience in selecting the correct product in combination with our hybrid technology and almost fanatical attention to detail, Efficiency Window can provide you with the look and performance of new window construction at the cost of retrofit window installation. Many window replacements qualify for a tax credit. You may never have had any need to know about replacement windows. They are not something that enters your mode of thinking – until it is too late. By that time, rainwater is infiltrating into your house, drafts are blowing, and the exterior of your home is looking shabby. 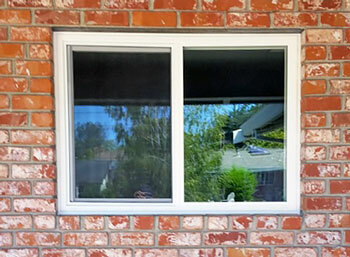 The replacement window replaces most, but not all, elements of an existing window. The existing window’s frame is retained, and the replacement window is fitted into this frame. The glass area of the replacement window will be slightly smaller than the existing window, however with expert installation, the actual appearance will have a more open look. Replacement windows typically are vinyl, with sealed glass. Wood replacement windows are available but are more expensive. Aluminum windows largely have become antiquated. Standard installation often means added bulk to the frame. Efficiency Window Replacement has developed a hybrid installation method eliminating unsightly bulk. Many homeowners, experiencing high energy costs, pull out all of their windows and replace them. In some cases, this is premature. The seals on the existing double-glazed windows may have failed, allowing cold or heat to more easily pass into the house. In this case, it is quite simple to repair or replace just the failed pane of glass, saving much money and effort. The replacement window installation industry has gained a reputation over the last several decades of being overly aggressive. This reputation is not entirely unfounded. Some companies use less-than-savory tactics to make a sale and fail to provide quality workmanship or warranties. Consumers are advised to obtain at least 5 quotes, to educate themselves as much as possible, and to check with their local Better Business Bureau prior to signing any contracts.